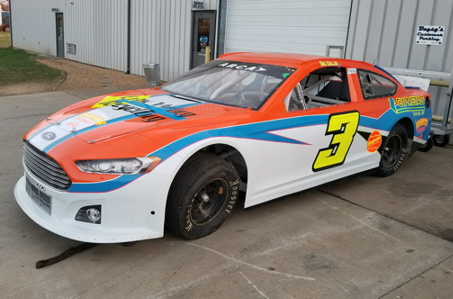 FREDRICKSBURG, Va. – A new year means a fresh start and a new partnership for Willie Mullins and Mullins Racing, who have teamed up with Hixson Motorsports for the 2018 ARCA Racing Series presented by Menards season. As part of the partnership the Mullins Racing Ford that Mullins will drive at select events in 2018 will sport the No. 3 instead of the No. 34 that the team has previously used in ARCA Racing Series competition in a partnership with Darrell Basham Racing. “I want to thank the Basham family for all the help they gave us over the last few years and for allowing us to use the No. 34. Since the Basham’s were unsure of their future and whether they were going to run a full season or not, we decided to go with a number that was going to compete in all the races in 2018,” Mullins said. “We’re excited to work with the Hixson team now. Since they’re scaling back their operation some we’re going to try and fill the void for them. Crystal Bates, crew chief at Hixson Motorsports, explained how the partnership between Mullins Racing and Hixson Motorsports came together. “About a month ago I reached out to Mullins Racing to see if they were going to be at Daytona in February and if they were, would they be interested in using one of our numbers,” Bates explained. “A week or two later we talked again and we put together a partnership that would allow Mullins Racing to use the No. 3 in 2018. The No. 3 is a legendary number at Daytona International Speedway but for Mullins, it’s just a number. His goal is add his own bit of history to the No. 3 when the ARCA Racing Series presented by Menards rolls into Daytona International Speedway for the season opening Lucas Oil 200 driven by General Tire on Feb. 10. Mullins Racing and Hixson Motorsports will both be on hand during the upcoming ARCA Racing Series presented by Menards open test at Daytona International Speedway in Daytona Beach, Fla., which is scheduled for Jan. 12-13. For more information on Hixson Motorspots, like them on Facebook at www.facebook.com/HixsonMotorsports2.3 and follow them on Twitter at www.twitter.com/ArcaHixson16.